I ate out, I ate out, I ate out. Naughty girl is me. Tonight, the Lucky Lazy girl explored Le Gourmet with her dinner buddy, Milyn. Kudos to Milyn's decision, we arrived at this Victorian Mansian opposite the Fitzroy Garden (well, it was dark and I couldn't see much of the park actually). Le Gourmet's owner/chef, Erich Mohr who graduated from a French culinary school offers French cuisine with strong Austrian influences, interesting. There were only two tables occupied in the soothingly-lit main dining room, with Victorian interior and soft furnishing; as well as a group of gentlemen taking up the private room at the back. We were greeted by one of the attentive and friendly waitresses with a warm smile, I was pleased. Welcoming greeting and professional service never fail to put a smile on my face. We started with a shared Blue swimmer crab bisque with a touch of Calvados as we know better than anyone that I won't be able to finish a three-course dinner by myself. Even without us requesting, the efficient waitress had already told the kitchen that it was for sharing and they had planned to serve us in two halves, just how we liked it. The bisque was rich and filled with the fresh aroma of the crab with chewy pieces of crab meat. Entrée that I had was the Spice-crusted Quail, boned and served with Mango relish on a broccoli salad - nicely crusted, a little like schnitzels I would say. Tenderness of the quail was preserved despite the crispy crust on the outside. The Mango relish went surprisingly well with the Quail, but my entrée is not to be compared to Milyn's Gingered blue swimmer-crab soufflé served with a watercress salad. 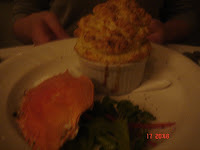 I had just a mouthful of the savoury soufflé that melts in my mouth with pieces of the crab meat in it, sensational was it! I'm going to have this all to myself on my next visit. 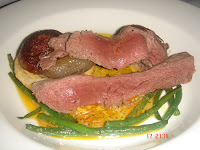 Opted Loin of Kangaroo on Café de Paris butter with onion tarte-tatin and beans after a long contemplation between that, the Poussin and the duck. The medium-rare loins were juicy and tasted exceptionally great with the butter gravy. Although I didn't have a try on the onion tarte Tatin (I don't eat onion at most times), Milyn was totally in love with the tarte Tatin, so I assume that it was good. 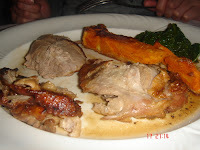 The only complain we (Milyn mostly) had was the Roasted crisp-skinned duck with pumpkin tart and spinach that she had as a main. The duck was a little too dry and tough, but it was acceptably delicious after she requested for some extra jus from the quick-to-respond waitress. I personally thought the pumpkin tart was yummy but Milyn didn't enjoy it that much. Personal choice was it. As oppose to what I've said in the car while I was starving - I'm going to have a full-course dinner - I didn't make it to the sweets. I couldn't even finish my main, what do you reckon? I was really disappointed with myself for unable to sample their infamous Salzburger Nockerl, a Hot Austrian soufflé with hazelnuts and chocolate chips, served with ice cream, fruit and hot chocolate sauce. I saw it being served on the next table and it looks absolutely appealing. I hate myself for unable to fit more food in my stomach. I've finally learnt a little more about Austria besides Mozart - exceptionally scrumptious fare. Oh yeah, the Austrian traditional duck liver pate (Enten Schmaltz) that was served on our arrival with bread is worth a mention, yummilicious! Next time, I promise, I've to have Salzburger Nockerl, as well as the Lime Brulee Tart. No more skipping dessert for myself. You know it's worth returning to this French/Austrian institution of 26 years when I am already planning on what to order on my next visit.